When I was going through some manuscripts in the Leiden University Library some time ago in preparation for one of my paleography classes, I came across an unusual medieval object: a small strip of parchment of 100×50 mm with small cursive writing on it. The object was pasted against the inside of the binding, which was likely done during rebinding in the 19th century. This wasn’t a manuscript, obviously, but neither was it a fragment of a manuscript, as one might be inclined to think (I blogged about such fragments some time ago). In fact, it was quite obvious that the small strip had always been this small, as evidenced by the observation that the text stays clear from the edges. Besides its modest proportions, another remarkable trait was the dark-brownish color and the slightly slanted sides of the object. What curious thing was this? The short answer is: a schedula (plural schedulae). 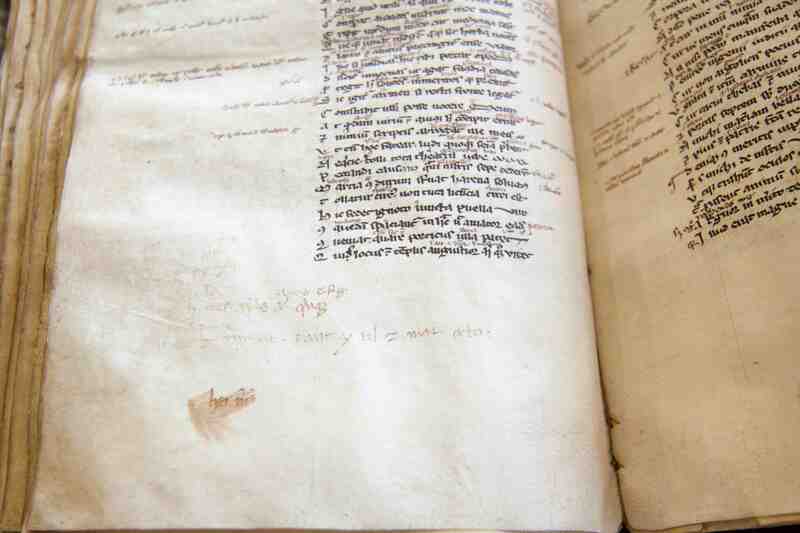 In the Middle Ages the term was commonly used to refer to a scrap of parchment on which a short text could be written. They were in essence the byproduct of parchment production. The reason for their existence lies in the odd shape of the prepared animal skin. The longer sides were slightly narrower in the middle, which gave them an elongated dent, while the shorter sides had various smaller dents around the location where the head and tail had been. The uneven edge needed to be removed. 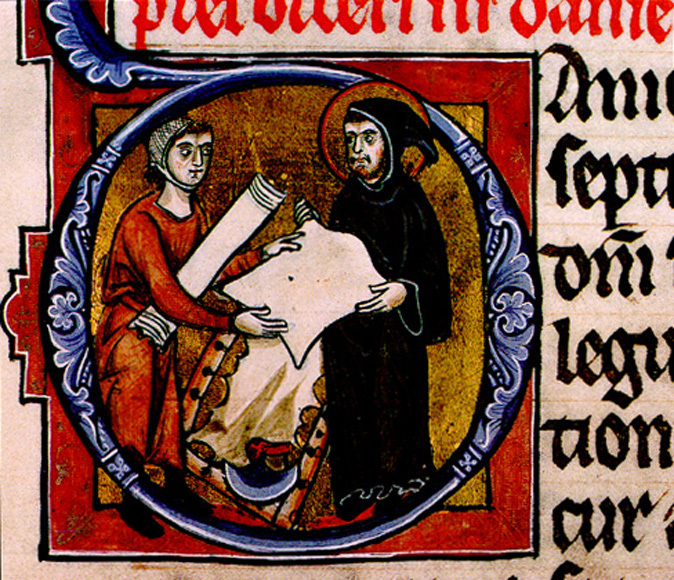 A well-known image from the 13th century of a parchment maker selling his product to a monk provides a clue as to what precisely was cut away. Note how the framed skin in the background has uneven edges that look quite different from the smooth-edged skin in the foreground, which has been cut from the frame and is ready for sale. To get from the former to the latter, long strips were cut off – presto: schedulae. These strips were not only deemed unsuitable for writing upon because of their odd size (long and skinny), but they were also riddled with deficiencies, such as stains, discoloration and translucent patches. The ironic thing is, of course, that because of their short half-life, schedulae that do survive are valuable. They shed light, after all, in corners of medieval written culture that have remained dark. The strip I encountered demonstrates this perfectly. The text, which can be dated to the thirteenth century, suggests these are notes made by a student, likely while he was attending class. Thus the unpretentious object provide us with a vivid look around the medieval classroom. We see the student pondering various themes that were popular at the thirteenth-century university. He is sparring, for example, with the notion of “propria voluntas” or “self will” and how it relates to sin. We can also see how the student is struggling to keep up with his teacher, writing at high speed in a cursive hand and using a high volume of abbreviations. Thus the strip is a welcome “real-world” addition to what we already know about note-taking from primary sources. De disciplina scholarum, for example, a study manual made in Paris in the 1230s, advices that students bring schedulae with them to class for note-taking. Evidence suggests that the strips were kept with the textbook, folded into the quires. The Leiden scrap was likely stored similarly: perhaps it fell out when the book was rebound, after which it was pasted in the back. It is right at home in the manuscript to which it is now appended. The host codex is heavy on texts used in education, most of which are also heavily glossed. The most notable of these texts, the first in the codex, is the very study manual from Paris that prescribes the use of schedulae for note-taking. Evidently, the student who filled this tiny parchment strip took the advice in the manual to heart, even though his notes suggest that he did not understand everything his teacher was trying to teach him. Bibliographical note – If you want to know more about the use of schedulae in medieval written culture, my study on the topic will appear here in September 2012. Note: This post was originally written for, and posted on, my project blog MedievalFragments.